This article analyses the issues present in micro-insurance and highlights operational innovations exhibited by two successful micro-insurance schemes based in Karnataka � Yeshasvini Scheme and Sampoorna Suraksha � which can potentially help scale up the micro-insurance coverage across India. Micro-insurance schemes inherently involve a trade-off between coverage, affordability and operating cost, and although different in nature of coverage and benefits, both the schemes discussed here have employed similar processes and tools to manage the trade-offs. These schemes have demonstrated how sustainable models of micro-insurance can be developed and scaled up, albeit with a new set of challenges. �	What is micro-insurance and how is it different from general insurance? �	Is micro-insurance really the answer for the poor to tide over crises? �	How have the Yeshasvini and Sampoorna Suraksha schemes managed to achieve the trade-off between affordability, coverage and operating cost? �	Can private insurance providers break the trade-off by replicating some of the best practices of these schemes? Are there some specific strategies for sustainability? Insurance products (risk-pooling to provide compensation to individuals or groups adversely affected by a specified risk) that are targeted at the lower income population are referred to as micro-insurance. This article treats all insurance products with a premium of less than Rs.400 under the umbrella of micro-insurance products. �	Liquid savings accounts: Typically of two types ��under the mattress� and savings groups. Both of which have significant limitations. �	Emergency loans: Emergency loans which are preferred when there is a sudden increase in expense without any increase in income. �	Micro Insurance: These might not be the immediate priority for most poor people, unless the product designed is such that a large section of the population has had some insurance experience (either through family or friends). Complex set of factors create uncertainties in the lives of the poor. The coping mechanisms used by the poor to deal with such uncertainties are contingent on a host of factors such as type of risk, planning propensity, poverty level, cash flow, social conditions, education, biases and risk tolerance. Despite such contingencies and complexities, it is our assumption that micro insurance can play a critical role in ensuring financial security to the poor. In this note, we are investigating whether organizations can offer micro insurance to base of the pyramid as a financially viable business. Unless micro insurance becomes financially viable as a business, it is unlikely to attract large number of organizations from the private sector to look into this opportunity. The issue of sustainability in micro-insurance is a trade-off between three competing objectives that the schemes strive to achieve. This trade-off has been depicted in Exhibit 1. 1. Coverage/Scale: Here it refers to scale both in terms of geographical coverage and benefits provided. The more the benefits provided by the insurance scheme, the worse will it hit the costs of operating the business. 2. Costs: Operating costs for the insurer increases dramatically as the number of touch points increase. Since most micro-insurance work with an annual premium of less than Rs.400, even a small variable cost added to the business (such as a change from black and white to colour printing of the health cards) adversely affect the business. 3. Affordability: It represents the price and transaction costs for clients. The micro-insurance market is highly elastic in nature and hence affordability is a key factor in the success of the scheme. The top 10 micro-insurance schemes in the country account for more than 95% of the market.2 Hence, the article analyses the strategies for sustainability of 2 schemes among the top 10 micro-insurance schemes in the country, which among them cover more than 75 lakh people. For the sake of diversity in the nature of study, the two cases chosen are different in the nature of benefits, premium charged and nature of ownership. However, a lot of operating procedures are common across the two schemes. The Yeshasvini Health Insurance Scheme aims to cover all surgical procedures and outpatient care for rural farmers and peasants in Karnataka. The scheme is now in its second year of operation and covers 2.2 million farmers and peasants who pay an annual premium of Rs.60 ($1.50) for the assured health insurance schemes. Yeshasvini�s target group is relatively poor farmers organised in cooperative societies (Exhibit 2). The scheme only covers major surgeries (more than Rs.1,600) with a maximum cap of Rs.2,00,000. The Trust and the health care providers have fixed a price for each surgery, including nearly all connected costs. All households enrolled in the scheme are in a business relationship with a cooperative society. Located approximately 300 km west of Bangalore, Shri Kshethra Dharmasthala is famous for the religious shrine of Lord Manjunatha. The temple trust runs a self-sustained micro-insurance scheme �Sampoorna Suraksha� under the Shri Kshethra Dharmasthala Rural Development Project (SKDRDP). The target of the scheme is the Self Help Groups (SHG) under the SKDRDP scheme and the SKDPDP staff members (Exhibit 3). Unlike Yeshasvini this scheme is a multipurpose insurance product that covers hospitalization expenses, maternity, death, domiciliary treatment and accidents. Trust is an important issue in case of insurance, more so for the base of the pyramid. This is because for insurance products, the customer is expected to part with her money in anticipation of a future benefit that is certain. Therefore, it is important that the target population trusts the organisation carrying out the last mile sale and delivery of micro-insurance. The Yeshasvini trust addresses this issue by selling the insurance schemes through cooperatives. Most of the network hospitals under the Yeshasvini scheme (like the Narayana Hrudayala, Bangalore and Jayadeva Institute of Cardiology) are hospitals of repute, and help reduce the issue of trust. On the other hand the SKDRDP SHGs help sell and collect premiums in the Sampoorna Suraksha scheme. Another interesting aspect of the SKDRDP is the religious influence of the temple in the areas where the scheme is active. Overall, the partner-agent model of selling insurance, where the main responsibility for product manufacturing lies with the insurer, which then delegates distribution responsibilities to NGO�s/organisations of repute, seems to be the best mechanism for handling the issue of trust. The nature of the benefits offered and product design can play a crucial role in reducing adverse selection and moral hazard. The Yeshasvini trust, for instance, handles the issue of moral hazard by restricting its benefits to major surgeries, as it highly unlikely that somebody would undergo unnecessary surgery. The Sampoorna Suraksha Scheme has a one month window in a year (February 15th to March 15th), during which the SHG members should enrol themselves, which gives them insurance cover for the entire year (April to March). This simple mechanism by itself reduces adverse selection. 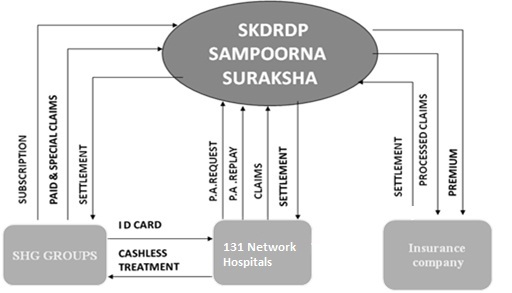 24 hour fax- preauthorization for cashless treatment is another mechanism used by Sampoorna Suraksha to handle the issue of fraud. Sampoorna Suraksha also has coordinators at the taluk level SKDRDP offices, who visit network hospitals in their area daily to check on the claims and patient status. Multi-level vigilance, such as random checks on hospitals go a long way in reducing hospital induced frauds. The mechanism of premium collection plays a crucial role in keeping the transaction costs under control. Yeshasvini collects premiums from producers� cooperatives who deduct the amount from the members� incomes. Similarly, Sampoorna Suraksha Scheme collects premium, once in a year during March, from the collective savings of the SHGs. This one-time event of premium collection converts the variable cost associated with premium collection to a fixed cost, incurred once in a year. Capping benefits, providing member benefits and buying benefits in bulk are some of the other ways in which these schemes have managed to control operating costs. Yeshasvini Trust manages to keep a check on the total potential benefits, which is essential for the viability of the scheme in the absence of any reinsurance, by capping the maximum amount that can be claimed at Rs.2,00,000. Similarly, the Sampoorna Suraksha extends a cover and cap of Rs.50,000 to the entire family. However, if the limits are set very low it could undermine the usefulness of the insurance cover. Increasing reach through some already established organisations/institutions is a very effective way of minimizing the operating costs for the insurer and the transaction costs for the insured. For example, by collaborating with cooperatives for selling the scheme as well as for premium collection, Yeshasvini Trust has managed to reach a big target population, thereby reducing the (fixed) administrative costs per insured and transaction costs incurred in premium collections considerably. Lastly, the schemes have also successfully bargained with the benefit providers to keep the operation costs low. Given the significant over-capacity in the local hospitals and clinics, Yeshasvini Trust has been able to persuade its network of providers to agree to fixed prices for operations, 30 per cent below the average price. Both schemes take care of the convenience of the policy holders through a complete cashless mechanism based on quick pre-authorisation of the claims. For a premium of just Rs.120 per year per adult, Yeshasvini covers more than 1,600 operations. The benefit covers surgery along with nearly all associated costs. Therefore, by focusing only on high-cost, low-probability items such as surgery it has been able to keep the premium at an affordable level while ensuring that protection is there when people need it most. However, while this approach undoubtedly benefits policyholders, the scheme does not cover many expensive treatments, including hospitalisation without surgery. Coverage, affordability and operating costs are three key sustainability challenges that any micro-insurance scheme faces. In order to address these challenges, the organisations need to look, first of all, at the issue of trust. The two schemes studied show that partnership with already existing credible institutions/organisations could be an effective way of addressing this issue. The article also explains the design of the insurance product or the process of delivering the insurance benefit to take care of the issues of adverse selection, moral hazard and fraud. Finally, the two schemes studied show how other schemes could employ suitable premium payment mechanism, capping benefits, providing member benefits and buying benefits in bulk to optimize their operating costs. In a broader context, however, there are a few challenges which, even, the relatively successful schemes (such as the two discussed in the article) have not been able to address to the extent needed, primary among which is a lack of insurance culture in the country due to which insurance is largely a push product in the market. Sourav Mukherji is an Associate Professor in the Organisational Behaviour & Human Resources Management area at the Indian Institute of Management Bangalore. An engineer from IIT Kharagpur, he obtained his doctorate from the Indian Institute of Management, Bangalore. He can be reached at souravm@iimb.ernet.in. Nishant Kumar Ojha (PGP 2009-11 at IIM Bangalore) holds a B.Tech. in Mechanical Engineering from Indian Institute of Technology (IIT) Kharagpur. He can be reached at nishant.ojha09@iimb.ernet.in. Churchill, C, 2003, "Is Microinsurance a priority for the poor? Understanding the Demand for Risk-managing Financial Services"
Radermacher R, Wig N, van Putten-Rademaker O, M�ller V, Dror DM, 2006, Yeshasvini Trust, India Series "Good and Bad Practices in Micro insurance", CGAP working group on micro insurance, Geneva.